Preheat the oven to 375°F. Butter a 9x13-inch baking dish, dust with flour and shake excess flour off. In a double boiler or water bath, melt the butter with the chocolate, stirring occasionally until completely mixed. In a small cup, combine the instant coffee with the coffee liquor or water, stir until almost dissolved and pour into the chocolate mixture, it will finish dissolving in the melted chocolate. Mix with a spatula and remove from the heat. Let cool. In a medium mixing bowl, beat the eggs with a fork or whisk until they have gained some volume and seem foamy. Add the sour cream, vanilla and sugar. Mix with a spatula until thoroughly combined. In a large mixing bowl, combine the all-purpose flour, baking powder and salt. Stir. Slowly pour the chocolate mix into egg mixture, mixing with a spatula as you do, until completely combined. Pour that mixture into the dry ingredients and mix until thoroughly combined. Finally, toss in the caramelized pecans and gently fold. Pour into the prepared baking dish and place in the oven. Bake for 20 minutes or until the top has lightly crisped, and the brownies are still moist but not wet (test with a toothpick). Remove from the oven, let cool and slice into squares. Sprinkle with confectioners’ sugar, if desired. These sound amazing. A friend asked me to bring Mexican Brownies to a dinner but I think they wanted some with spice—like chili pepper and/oe cinnamon. Is that authentic? Do you have any version or variation like that? Otherwise these sound sublime. Oh you can add some spice to the brownies, Angi…but I don’t have a recipe like that. Pati, I’ve been a big PBS fan on KCPT, Kansas City for years. My libraries got so tired of me me checking out your books that I had to to buy the two that I know! I love your program, your recipes, and the fact that you always want me to start a party in my kitchen! Also, that you are so generous with sharing the recipes on the internet! Gracias and a grateful big thank you! Awww thank you Cynthia! I hope you are absolutely loving your books and having lots of parties in your kitchen. Hi Pati! Thank you so much for this amazing recipe. I saw you make these brownies on the food Network in Australia and just knew they’d be a hit with my work colleagues. I took a batch to work today and everybody raved about them- Just what the doctor ordered to get us through the dreaded mondayitis. I used some salted peanuts instead of pecans, as that’s what I had in the pantry, but am eager to try pecans next time. Muchos grazias! Oh I hope you had a good Monday then, Jessica! I did, thanks to your brownies 😊 thanks! Patti, I just watched you make “Extreme Brownies with Caramelized Pecans”. Yummy! I found the recipe, but it doesn’t tell me how you made the pecans, and i didn’t write the recipe as you were making them. Could you please send me the recipe for Caramelized Pecans, the ones you made in the tv show. Thank you. Pati, are these brownies cakey or fudgy? I really enjoy your recipes and am looking forward to trying your Mexican Mac and Cheese. Thoroughly enjoy watching your show. I think they are smack right in between! And you will love the Mac and Cheese, it is a big hit at home. hola pati i wanted to ask you if you can send out your video of your extreme brownies cause i can’t find the video on Youtube please it would help me out alot. Hola, Irene! You can find Maggi sauce in most grocery stores, look in the latin or international isle… ask the grocer. Thanks for trying out my recipes and for tuning in each week! Hi Pati, Thank you so much! I LOVE your creativity, your show, & your cookbooks, having been a fan of yours for awhile now. Sometimes our local PBS reruns your shows and I watch them again and always learn something new. Your Extreme Brownies w/Carmelized Pecans is really over the top delicious! I live where pecans are relatively plentiful; they are my favorite tree nut. I practiced piano while the brownies were baking… perfect combination. Hi Pati – We love your show and we made your Extreme brownies yesterday and had them for Mother’s Day! They were the very best brownies we have ever had. 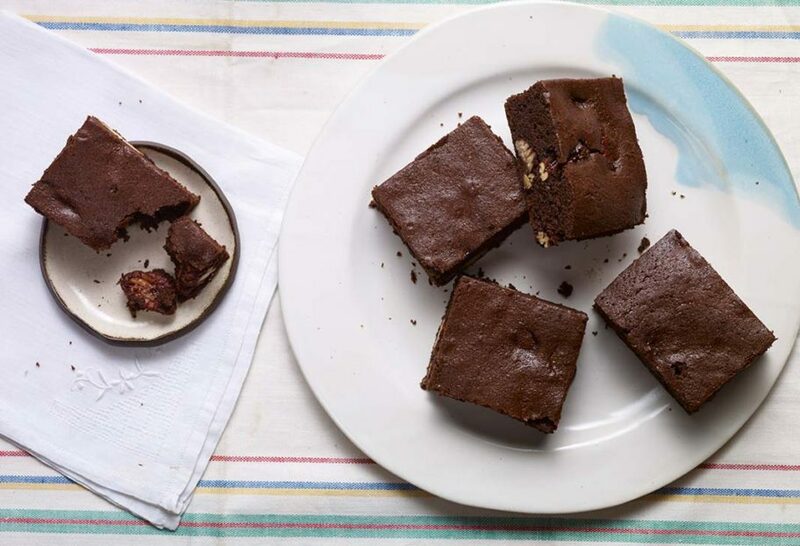 The caramelized pecans are worth the effort as they make these brownies. We love seeing your beautiful smile and positive outlook on life. Oh Brenda! Thank you so much for your very generous message. I hope you continue to try, and hopefully love, more of my recipes. I finished gardening and turned on PBS.. have never seen your show before. I have cooked all my life and I am now 77.. I want to locate your shrimp cocktail with parsley and cilantro. + the flourless chocolate cake. Thanks Ruth!!! I hope you try some of the recipes soon! My family and I have enjoyed your recipes from this weekend’s show! We made Mac ‘N Cheese Mexicano, Chipotle Agave Chicken Wings and the Extreme Brownies are baking now. The caramelized pecans almost didn’t make it into the brownies, my kids and I came close to eating them all! I am so happy that I found your TV show and blog.